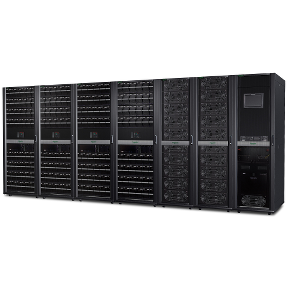 A high-performance, 3-phase, modular, scalable, power protection solution with industry-leading efficiency, capacity, and performance for medium to large data centers and mission-critical environments. Multiple UPSs can be installed in parallel for ultra-efficient system redundancy or up to 2MW of power protection. Parallel installations with custom switchgear and installations using a 3rd-party maintenance bypass panel require the APC Symmetra PX250/500 Third Party Switchgear Kit for breaker monitoring and EPO functionality.